The 14th Edition of Zoom Festival International Fiction TV took place last week in Igualada. On Saturday November 26th Isabel Esteve presented Auguri Sita Murt Award at the closing ceremony. The outstanding actress Júlia Molins receives the Sita Murt award this year. She acted in diverse short films, films and series like “El último día de febrero”, “Hooked up” and “Cites” in TV3 channel, or “Seis Hermanas” in the national channel TVE. Zoom Festival always gathers main influencers from the audiovisual world. It’s a very entertaining event that engages all the members together all the week long. The very emotive closing ceremony reflected the greatest success of the festival. All Sita Murt team feels really happy of being part of the festival one more year. 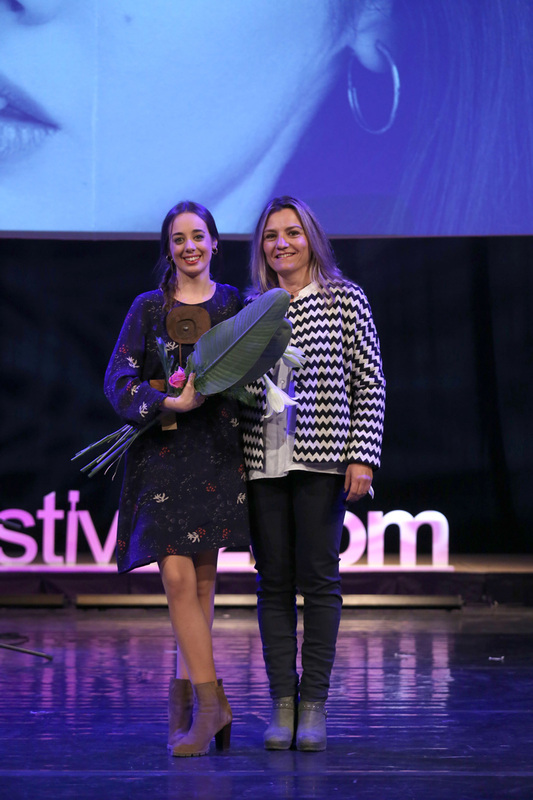 We want to name the good interpretation of the host Llum Barrera during the evening, and also congratulate Júlia Molins for her award-winning. We wish Julia good luck and a lot of success in her professional career! The festival count on the presence of the actress Marta Vives, who was wearing a incredible and exclusive Sita Murt dress from the Catwalk Edition.